Register Now for City's 3rd Annual Citywide Garage Sale! Home More News Register Now for City's 3rd Annual Citywide Garage Sale! 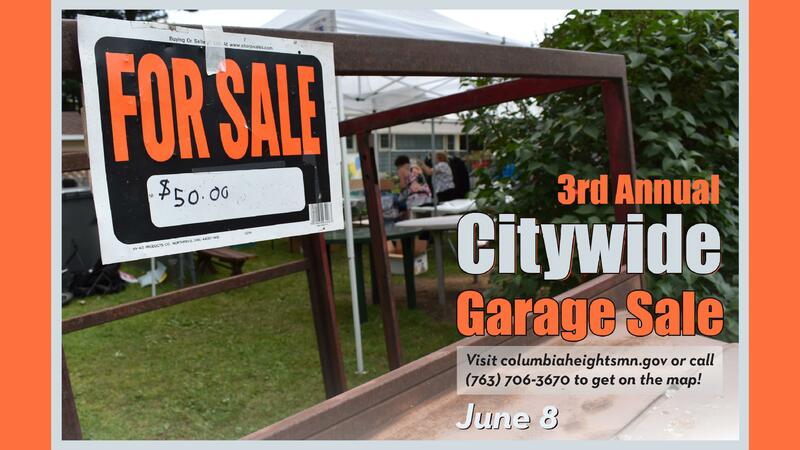 The City of Columbia Heights will be hosting the 3nd annual Citywide Garage Sale Sat, June 8. All residents are highly encouraged to participate in this event. Citywide Garage Sale maps will become available on Mon, June 3, at all municipal buildings or for download online. The interactive map will be mobile-friendly and include item categories with details on what will be sold where. The Citywide Garage Sale is a great opportunity for residents to clear out any unwanted stuff, help neighbors find one-of-a kind deals, or to just get outside and walk around. Last year, more than 70 households in Columbia Heights participated. This year, the goal is to have 100+ households registered for the sale. Please note, registration for the sale is limited to Columbia Heights residents only. There is no fee to participate.